The DeWalt DC920KA is a heavy-duty 18V cordless drill/driver that has a high power motor for maximum performance in all drill/driver applications. This unit weighs only 6.3 lbs. and has ergonomic grips increasing the feel and control of the drill/driver. The DC920KA is built to allow for standard nut drivers and a variety of screwdriver bit tips to be stored on the tool. 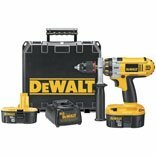 DEWALT® built high power, high efficiency motor delivers 510 unit watts out of max power for superior performance in all drilling and fastening applications. Superior ergonomics optimize balance, size, and weight. So far we like, haven't started on the project we bought it for, but we are confident it will perform well. I can't comment on how long this drill will last but it is without question the finest drill I've ever used. Wood screws seem to almost effortlessly leap into pressure treated decking. Balance is very good as is the option of three different speed/torque ranges. If the drill has a downside it is that I would have prefer lithium ion batteries to the nicad version but I'm sure the nicads will work just fine for my purposes. If however you desire to purchase the lithium ion batteries they will fit on the drill even though they are slightly shorter in length. I can only say that I am a man who loves my tools and I love this one most of all. A man once told me, "You buy a quality tool and you regret it once, you buy a cheap tool and you regret it for the rest of your life". This is simply the best screw gun I've ever had. I know some have a bigger battery, hammer drill, etc etc. I want a screw gun, drill that works hard and runs forever. 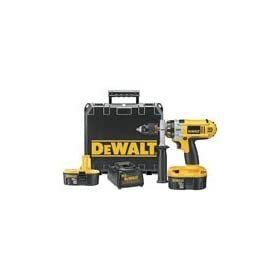 I'm sold on Dewalt. We live off the grid and sometimes need a heavy duty drill to do farm repairs. Our nice little 14 volt is great for small jobs, but for those times when we need to drill into fence posts and have alot of power with a battery that lasts, this was our solution. The drill is heavy so we still need our 14 volt (also a Dewalt) for roofing screws and small jobs. The XRP battery is so long lasting that we do not need to spring for a lithium battery.